The history of Assos, now called Behramkale, extends back to 8th century BC. It was then ruled by the Persians and later was annexed to the Athenian Union in the 5th Century BC. Later on, the town was privatized and started to be ruled by the banker Euboulos. The following ruler of the town was the banker's heir, the liberated slave Hermias who was the student of Platon and a friend of Aristotie. The founder of the "Aristotelian Logic" resided in Assos for three years and gave seminars. The 3 km masonry of the walls surrounding the town is outstanding. The Assos city walls with many gates each with a different shape and design is the most resilient and best preserved architectural work of the Hellenistic Civilization. The recreational core of Assos is concentrated in a very tiny basin.Climbing up the hills and looking down at the sea you will see the ruins of an ancient town immersed in seawater and by adjusting the angle of your sight a bit higher up, the Mitylene Island in the near horizon, surrounded by deep blue water. The acropolis of the town which is reached through the village is at 238 m altitude. The inner city walls were repaired both in the Ottomantime and in the present. 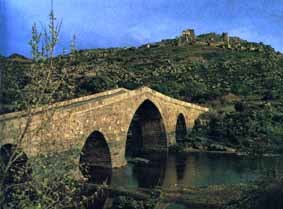 The mosque on the side of the road and the the bridge were built in Sultan Murat I's period. There located at the spot where the acropolis dominates the sea most, is the Temple of Athena. Some pillars of the temple have been re-erected. The reliefs belonging to this temple are on display in the museums of Paris, Boston and Istanbul. The panorama in Assos is best viewed from this hill. Chryse Apollon Temple in Golpinar which falls to the West of Assos and the Alexandrian ruins extending from Odunluk Port towards the thermal springs can be visited as well as the ruins of palaces, theaters and baths. The place was founded as a town of natural springs in III. Century BC. The Neandreia ruins where you can see the temples and graves of the Hellenistic Age are near Kayacik Village of Ezine on the Cigri Mountain 13 km from Assos. Kucukkuyu, on the eastern side of Assos, is one of the rarely found locations apropos for a complete rest with its sandy beach and quiescent beauty which has not, as yet, been affected by the encroachment of summer residential building co-oper-atives. A silent evening is best enjoyed here after trips to the historical ruins in the surrounding. The summer residences which have already occupied Akcay and Altinoluk fully, are preparing to lurch to this side. We recommend a visit to Kucukkuyu before the big attack starts.